Mankind has only 12 years left to make unprecedented cuts in greenhouse gas (GHG) emissions if we want to stave off unimaginably catastrophic effects of runaway global warming. This is the warning detailed in October’s report from the United Nation’s Intergovernmental Panel on Climate Change (IPCC), the recognized global climate authority which represents the investigations of hundreds of climate scientists and 195 participating nations. 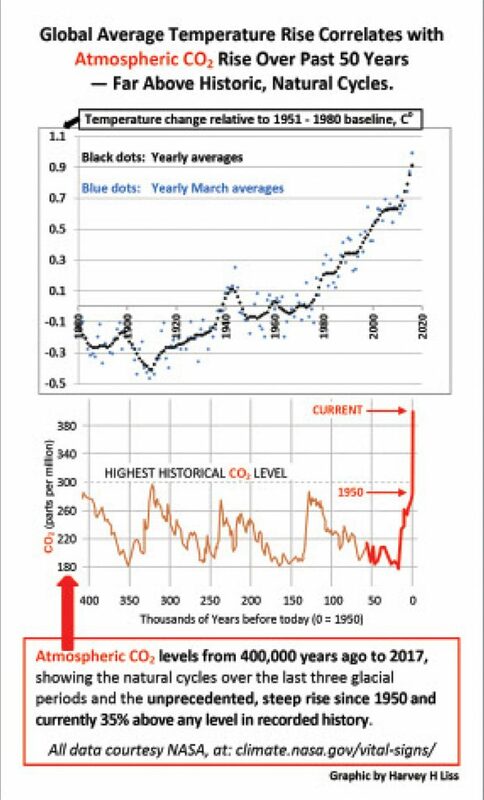 A 2.0 degree Celsius average global temperature rise above pre-industrial levels was previously viewed by the IPCC as the tipping point beyond which global warming would spiral out of control with incomprehensibly negative consequences for humanity and the planet. We are fully half way to this cut-off, but more to the point is the revised projection by the IPCC that the worst effects will emerge with a smaller temperature rise of just 1.5 degrees Celsius (2.7 degrees Fahrenheit). Preventing the 1.5 degree rise necessitates, by 2030, a 45 percent reduction in GHG emissions compared to 2010 levels, with “net zero emissions by 2050” which means all emissions need be balanced by removal of an equivalent amount from the air. If GHG emissions continue instead at the current rate, the 1.5 degree mark will be reached in 2040, producing environmental havoc that effectively ensures the end of civilization as we know it. Picture a future defined by poverty, food shortages, coastal flooding, mass migrations, ferocious storms, bigger and more intense wildfires, plus unrelenting heat that makes parts of the world unlivable. Hearing this, Americans should be screaming from the rooftops, demanding to know how our government will prevent this very real existential threat to our own and our children’s future. The California Primary contest for the “top two” candidates in Congressional District 45 is over. On November 5, incumbent Rep. Mimi Walters will be facing UCI law professor Katie Porter. The City of Irvine lies entirely within District 45, and the fact that Irvine residents comprise 40 percent of the district’s population means Irvine voters are extremely important to determining who will win. The voters whom both Walters and Porter need to attract are increasingly concerned about climate change. Fully 73 percent of registered voters believe that climate change is happening, and 59 percent believe it is mostly caused by human activities, according to the latest national poll. At the constituent level – even if not in the halls of Congress – climate change has become noticeably less “political.” Belief in human-caused climate change is still strongest among Democrats, but now includes a significant majority of liberal/moderate Republicans as well as voters with no party preference (small “i” independents). “Worry” about climate change has even increased by 7 points among conservative Republicans since just last October. Mimi Walters serves the 45th Congressional District which includes Irvine, Tustin, North Tustin, Villa Park, Laguna Hills, Laguna Woods, Lake Forest, Rancho Santa Margarita, Mission Viejo, the Canyons and parts of Anaheim Hills, Coto de Caza and Orange. In November, residents within California’s 45th Congressional District will be deciding whether to entrust Mimi Walters with a 3rd term in the House of Representatives. She is facing a tough reelection battle, so in a race where every vote counts, it’s incumbent upon voters to take a serious look at her performance record before entering the polls. Because the projected impacts of unchecked global warming are so dire, climate change has become the number one challenge facing humanity. Worsening storms, droughts and wildfires, catastrophic sea level rise, mass species extinction, disrupted food supplies and political and social unrest are all in the offing if we fail to transition from a fossil fuel economy to one based on renewable energy sources. Though poorer communities and nations will be impacted most, material wealth cannot guarantee that our children and grandchildren will be spared serious consequences. The years 2016 and 2017 were the first and third hottest on record, respectively. Many residents of Orange County have personal stories of how climate change is already touching their lives. The Yale Program on Climate Change Communication tracks public opinions on climate change, down to the individual district level. It turns out that California’s 45th is very much in step with the nation as a whole: 71 percent in the district believe climate change is happening, 74 percent want carbon dioxide regulated as a pollutant, and 72 percent believe future generations will be harmed. As a public servant, Mimi Walters is obligated to represent the views of her constituents, especially on an issue as vital to public security and prosperity as climate change. But, does she? Tiny lanternfish is vital to carbon sequestration in ocean. Though burning fossil fuels is the primary cause of global warming, fossil fuels could also be driving climate change via a completely different mechanism involving ocean plastic debris and tiny, bioluminescent fish living hundreds of meters beneath the ocean’s surface. Lanternfish (aka myctophids) are only a few inches long typically but so ubiquitous that they account for over half the ocean’s total fish-mass. They are vital to the ocean’s ability to sequester more carbon than all the world’s forests do on land through a daily mass migration that plays out in all seven seas. By day, lanternfish avoid predators in deep, dimly lit waters, but they ascend nightly to the surface to gorge on carbon-rich plankton before descending back down where they deposit their carbon-rich poop. They also sequester carbon when eaten by larger fish. Carbon sequestration by lanternfish is central to the overall role of marine environments in reducing human-caused CO2 emissions in the atmosphere – by an estimated 20-35 percent. Doing those things definitely makes me feel good about myself, but none of my personal actions move the world measurably closer to solving the climate crisis. My journey to this conclusion started by first looking into my personal carbon footprint using readily available online tools. The U.S. EPA’s carbon footprint calculator, for example, looks at three sources of greenhouse gas (GHG) emissions: home utilities for heating, cooling and cooking; vehicle fuel efficiency and miles driven; and waste generation. In these areas, my carbon footprint was roughly half that of other people living in my zip code, suggesting my eco-conscious efforts are paying off. However, it’s eye-opening that roughly two-thirds of Americans’ GHG emissions are embedded in so-called “indirect” emissions released during the production or manufacture of other things we consume, such as food, household supplies, apparel, air travel, and services of all types, according to an in-depth analysis by the Center for Global Development, a non-profit policy research organization. Another way to understand indirect emissions is to think of the money spent on everything not included in the EPA’s more limited carbon footprint calculator. Though President Trump has withdrawn the U.S. from the 2015 Paris Climate Agreement, this is no time for the 70 percent of Americans who believe climate change is happening to recoil in defeat. Rather, we should feel empowered that a 2016 post-election poll of registered voters found that majorities of Democrats (86%), Independents (61%) and Republicans (51%) alike wanted the United States to participate in the accord and that two out of three voters said the U.S. should reduce its greenhouse gas emissions regardless of what other countries do. Thus, it is exactly the time to speak out against the misguided actions of The White House by taking decisive steps well within our reach as individual citizens and communities. After all, the Paris Agreement is only a broad-stroke commitment from participating countries to collectively limit global warming to 1.5 to 2.0 degrees Celsius (°C) compared to preindustrial levels. It has always been true that only Congress and legislative bodies at the state and local level, not the President, can enact laws that can move us from a fossil fuel to a sustainable energy economy. Here’s what’s happening at various jurisdictions around the nation already. Irvine led on restoring the ozone layer and should lead now on climate change. The depletion of the protective ozone layer in the Earth’s atmosphere by man-made chemicals was the global community’s first environmental crisis. Today, climate change, largely attributable to greenhouse gas emissions from burning fossil fuels, is the second and far more frightening crisis. The people of Irvine can be proud that actions taken by the City Council in 1989 were instrumental in creating a blueprint at the local level for carrying out the aspirations set forth in the 1987 Montreal protocol, the international agreement to restore the ozone layer. It is widely hailed as the most successful global environmental treaty ever. As the global community today faces the reality that unchecked global warming could unleash catastrophic effects impacting all future generations, Irvine can and should resurrect the same purpose and determination that inspired the City to make a difference back then. In 1974, scientists at UC Irvine, led by Nobel laureates (1995) F. Sherwood Rowland and Mario J. Molina, predicted that the Earth’s protective ozone layer would be seriously diminished by the rampant use of halogens — chemicals, such as CFCs (chlorofluorocarbons) and other ozone-depleting compounds then used as refrigerants, spray can propellants, and solvents. The ozone layer acts as a shield, preventing the most harmful ultraviolet radiation in sunlight (UVB) from reaching the Earth’s surface. Excessive exposure to UVB is known to cause not only sunburn, skin cancers and cataracts but also damage to crops and reduction of plankton populations vital to the ocean food web. It wasn’t until 1985 that the infamous hole in the ozone layer over Antarctica was discovered, as Rowland and Molina predicted. That triggered the international alarm that led to the Montreal Protocol. Because action at the federal level was painfully slow in coming, the Irvine City Council, then led by Mayor Larry Agran and City Councilmember Cameron Cosgrove, boldly passed the most far-reaching, legally enforceable measure anywhere to eliminate CFCs and other ozone-depleting substances. This remarkable ordinance prohibited using CFCs and other targeted halogens in most industrial processes in the City of Irvine.